Synopsis: Cinder, who is a cyborg, struggles to find her place in the world with her evil stepmother, Adri, who despises her. Cinder, however, is a very gifted mechanic, which leads her to meet New Beijing's Prince Kai. This encounter then develops into a special relationship. As the story unfolds, Cinder is faced with many decisions that will impact her family, Prince Kai, New Beijing and even the earth's fate, as the Lunar Queen evil shadow is cast. However, Cinder discovers the one most important factor about herself that will change everything. Why Did I Pick This Book? : I got it as a birthday gift from my sister. Also, I really love fairy tales! I love them all! 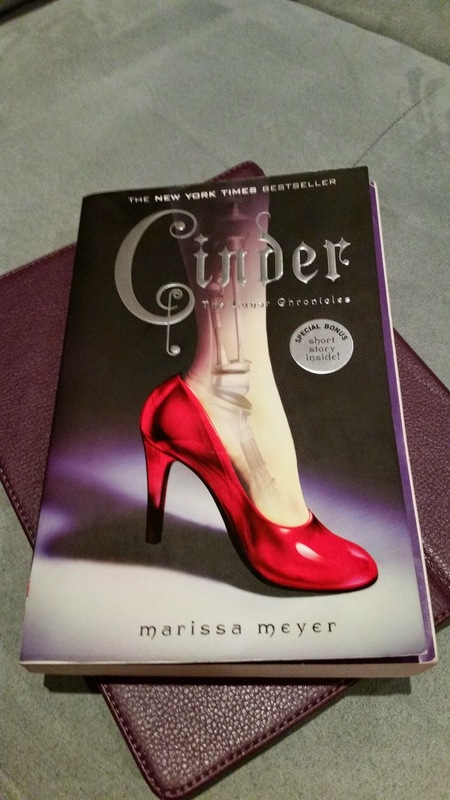 I thought it would be interesting to read about a twist on the classical Cinderella story. Favourite Part: I can't reveal exactly what happened during this part as I will give away too much. But I love the part where Cinder discovers the one most important factor about herself that will change everything. It will literally change her fate, others and the worlds. At this point in the story, she goes from being so insignificant to being the most important person alive. Lessons Learned: Everyone has something special inside of them no matter what they look like on the outside. Never judge a book by its cover! Also, life is full of surprises; some are good and some are bad. You just have to roll with the punches. Would I Recommend It? : I would recommend this book to anyone who is completely fascinated with fairy tales or fantasy/sci-fi books. If you are looking for an easy and quick read that's interesting, this may be something to pick up. How Would The Movie Do? : I think this would make a better movie than a book, for sure! In fact, I could totally see the movie being a huge hit! Would I Read Other Books By This Author: The author has other stories in The Lunar Chronicles that all link together. I would be interested in reading the others to continue the story of where Cinder left off. First Impressions: I-cannot-put-this-book-down! It is so good! I mean I've heard raving reviews about the movie so I figured the book would be really good as well. I'm absolutely loving it and have finished about a quarter of the book in less than a week (this is a record for me!). I'm really interested to see the movie after reading the book.